Eight figures quickly dashed out of the trees, each one of them bursting with excitement. Suddenly, the eight of them saw a familiar face and rapidly approached him. They had a picture of the youth and heard the details about him so they could confirm that it was the young male they had been bitterly searching for. Especially the leader of the group. He had exchanged blows with the kid, how could he make such a mistake? Under the confused gazes of the eight men, a youth rushed towards them with a saber in his hand. Behind the kid followed three angry-looking youths. Their Yuan Qi bursting out from their bodies and was slightly older but not much different from Su Yi. Seeing this sight, the expression of the eight men changed. So, the kid was not alone. He had people to help him and after seeing the age of the three youths behind him with in addition to the fact that they had killed the Hell Wolves, these youths were definitely together. The leader hollered out his orders. They were a bunch of experienced men within the Forest of Demons, why should they be scared of a few newbies? He instantly rushed forth to meet the youths in battle. The leader’s words had a great motivational effect. The morale of the men behind him skyrocketed and fiercely rushed forth. Zhouda, Guoyan, and Qingfeng were hot on Su Yi’s tail. As they were about to catch up to him, they suddenly saw eight men furiously charging towards them and they became worried. Guoyan became enraged. He felt that the auras of the few men were not all that strong and did not retreat. Instead, he sped up and charged at the men. “Kill them! How could we be afraid of this mob? !” Zhouda bellowed. He was not afraid of the men. He no longer held back his Yuan Xuan Realm aura. Yuan Qi formed under Su Yi’s feet and he instantly sped up. Looking at the eight men charging straight at him, he did not even need to think to know that they were the ones from the adventurer party. His eyes seemed to be smiling coldly as he maintained his fast speed. The two sides were about to clash, and everyone let loose their aura without any hesitation. Su Yi was in front of everyone else. Just as the people from the adventurer party was about to reach him, he abruptly turned and dashed towards the forest on the side. And at the current moment, Zhouda, Guoyan, and Qingfeng were already right behind Su Yi. The men from the adventurer party could not stop their advance as well. No one had expected Su Yi to make such a move. But each side thought that the opposing side was Su Yi’s allies, hence each of them was ruthless and attacked each other. Qingfeng had absolute authority over Zhouda and Guoyan. His hand was already holding a treasured sword, his Yuan Qi bursting. The light of his blade seemed to be solid, swift and sharp. He clashed fiercely with the adventurers. The leader’s eyes were glued onto Su Yi. He was the main objective and he went on to chase Su Yi. Among his people, other than him, there were still two more Yuan Xuan Realm cultivators. There was no need to fear these youths who were not average. Rather, he must not lose sight of the main target. Su Yi turned and ran. Anyways, he had no good feelings towards the few youths. He also knew the ability and cultivation of the group of youths. It was more than enough to deal with the adventurers. So, when he saw the three Hell Wolves, he had a ‘eureka’ moment. When shepherds quarrel, the wolf wins the game. He could just sit by the side and watch with glee as the two sides fight with each other. But Su Yi was also afraid that the two sides would suddenly realize that they had been fooled. At that moment, it would be bad news for him. So, he would not stay and fight. It was better for him to retreat to a safer distance. Suddenly, there was a shout behind him and a figure rapidly chasing. Su Yi felt that the voice was familiar like he had heard it before, but he did not slow down, it was better for him to leave this place. But with the 500-kilogram sword on his back, Su Yi had been slowed down heavily. It did not take long for the Yuan Xuan Realm cultivator behind him to catch up. The man behind him yelled. His hand held a short spear filled with Yuan Qi and threw it towards Su Yi like a streak of lightning. Enveloped by Yuan Qi, the short spear glowed, and its sharp tip ripped through the air, howling as it shot towards Su Yi’s back as fast as lightning. In the heat of the moment, Su Yi leaped to the side while turning around and barely dodged the attack. But as a result, he had to stop. After Su Yi dodged the spear, it pierced into a tree behind him. The immense force of the spear nearly shot it through the tree. The bark splintered, and cracks ran up and down the entire tree as leaves fell to the ground. 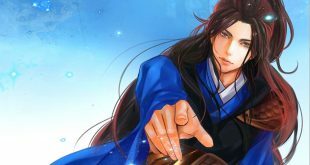 With Su Yi completely stopping for a brief moment, the man rushed forth with the second short spear in his hands and stabbed towards Su Yi like lightning, cold and precise. Su Yi sneered coldly. He had already prepared for this, the mercilessness in his eyes was together with a bit of hope. As he shouted in his heart, he had already initiated the technique. Yuan Qi surged through his body and the special meridians before converging on the huge saber in his hand. In that single instance, there seemed to be a dragon roar coming from the saber. Its momentum was thunder and violent winds. With an unmatchable ferociousness, it slashed at the short spear. The spear and saber collided and the auras of the two sides surged through the air. With a “crack” sound resounding through the air, there was a ripple of force followed by a violent wind tearing through the place, sending stones and sand flying. Su Yi staggered backward a few steps and wherever his foot landed, the ground shook slightly. His opponent, on the other hand, slid backward several meters, his face filled with shock. The man was the Yuan Xuan Realm Second Grade cultivator that had fought Su Yi last time. Now, the purlicue was sore and the hand holding the short spear was quivering. He was astonished. The last time he fought, even though the kid was stronger than average, he was still able to suppress him. But from what he could tell from the strike, the kid now seemed to be able to suppress him instead. He turned his hand and pulled out the short spear stuck in the tree behind him, holding two short spears in his hands once again. The man did not dare let his guard down for even a second. He stared closely at Su Yi. Su Yi raised his eyes and looked at the man in front of him. He had fought against him before. The original two short spears which had been broken in half seemed to have been replaced by two new spears.